A review of The Politics of Education: Popular Education, Quotidian Experience, and Contention over the Masses in China, 1927–1937, by Miao Feng. During the “Nanjing Decade” (1927–1937), China faced a complex and rapidly developing social crisis that seemed to span all realms of life. Chinese intellectuals converged around a common strategy to resolve this crisis: the mobilization of “the masses” behind a program of national defense, social restructuring, and economic development. As Miao Feng shows in The Politics of Education, discourse on mass education became one of the central arenas in which to work out the nature of the masses and the methods to mobilize them. Arguing against earlier studies that reduce education reform to the handmaiden of industrialization or that position it as a missed alternative to revolutionary change, Feng insists that education be understood as an “interpretative space of the emergence of new politics” (p. 13). Through debates such as those around education, a qualitatively new conceptualization of politics emerged after the dissolution of the first United Front in 1927, reshaping theory and practice within each of the leading political currents. In four chapters, Feng provides a detailed analysis of the three central approaches to mass education in this period, developed respectively within the Communist Party milieu, by educator Tao Xingzhi, and by members of the Guomindang Central Club faction. All these practitioners were determined to expand education beyond the boundaries of the elite by integrating it into the everyday life of the masses. Likewise, all positioned education as instrumental to larger national purposes. Intervention in the quotidian lives of the people was ultimately aimed at drawing them out of their parochial circumstances toward a patriotic consciousness and instilling in them the skills they would need to act on it. Yet several very different forms of practice emerged from this shared orientation. In Chapter 1, Feng explores the educational theories developed in the mid-1930s by a group of Communist journalists based in Shanghai. In urban areas after 1927, the Guomindang’s White Terror foreclosed earlier Communist themes of workers’ struggle against capitalists and imperialists. Liu Shi, Xia Zhengnong, and Ai Siqi—journalists and theorists working at the library attached to Shenbao newspaper—developed a new approach that was ultimately expressed in the magazine Dushu shenghuo. This publication’s readership was not factory workers but the “petty urbanites” (xiaoshimin), a broad group ranging from clerks to shop assistants and apprentices. The working conditions of the xiaoshimin—long hours, low pay, insecure tenure, and limited room for advancement—aligned them with the underclass of slum dwellers. Yet their literacy and access to mass culture bred a sense of superiority over other workers. The Dushu shenghuo group sought to overcome this divide by cultivating a proper “recognition” among the xiaoshimin of their place in society. This represented not only a shift in the target audience for Communist media, but also a fundamental change in technique. Rather than rehearsing abstract theories of broad historical forces and class struggles, Dushu shenghuo spoke directly to the concrete experiences of its readers, who expressed intense frustration as the promise of individual success through a strong work ethic proved increasingly illusory with the arrival of the Great Depression in Shanghai. Whether responding to readers’ personal stories of professional or romantic disappointment or analyzing the sense of despair that led film star Ruan Lingyu to take her own life, the Dushu shenghuo writers explained how the bourgeois desire for individual self-mastery necessarily foundered on the invisible forces unleashed by commodification. They counseled a new orientation to society through a new practice of reading and writing, aimed at bringing the individual into alignment with the masses by distilling the universality contained within everyone’s particular experience. Like the Dushu shenghuo group, educator Tao Xingzhi developed a transformative pedagogical technique that started from the quotidian experience of the masses. Having studied with John Dewey, Tao traced class stratification not to the relations of production but to unequal access to education, an analysis that led to a very different target audience and set of political aims. In Chapter 2, Feng shows how Tao radicalized Dewey’s ideas and applied them in the village of Xiaozhuang outside Nanjing starting in 1927. Rather than an urban coalition of the masses against the foreign and native elite, Tao’s goal was a self-sufficient rural community that could resist the lure of urban ideas and the power of global markets over local production. Grassroots democracy was to work hand in hand with an everyday practice of education to generate authentic local knowledge and leveling modes of cooperation. After the Guomindang shut down the Xiaozhuang experiment in 1930, Tao moved in a new direction. In Chapter 3, Feng explores Tao’s attempts to reformulate China’s cultural inheritance with the intention of constituting a truly mass response to global crisis. His ultimate goal was to revive a lost “mass consciousness” that, he argued, had been suppressed in dynastic times by elite culture and more recently by urban commodity culture. Through a reformed writing system based on the Roman alphabet that would facilitate mass literacy, and through the spread of group singing practices, Tao believed that the masses would be able to articulate their emerging collective feeling. In this process, he maintained, it was incumbent upon the teachers to learn from the masses as well as to guide them. In Chapter 4, Feng moves to Guomindang educational theory, which notably denied that the teachers might have something to learn from the masses. A group affiliated with the Central Club faction of Chen Lifu and Chen Guofu organized a body called the Chinese Culture Construction Association. In 1935, the CCCA convened a nationwide “reading movement” designed to reduce illiteracy among the masses while instilling correct reading habits differentiated according to social group. Like Tao Xingzhi and the Dushu shenghuo writers, CCCA members such as Chen Gaoyong sought to mobilize popular forces in order to establish China’s independence and to cultivate a collective identity against the individualism and decadence they identified with foreign influence. Yet the reading campaign was posed in a very different way. In place of the sympathetic, persuasive approach to their pupils that Dushu shenghuo and Tao Xingzhi adopted, the CCCA lectured the masses on their failure to learn modern skills and blamed them for the country’s predicament. These contrasting modes of address arose from a different conceptualization of the masses themselves. For Communist writers and Tao Xingzhi, the goal was to constitute the masses as a genuine political subject, and the teacher–student relation was to be one of mutual influence. Guomindang educators, in contrast, imagined the masses solely as an object of administration, with teaching understood as a strictly top-down affair. Following from this, the subjects to be taught were not how to conceptualize society or how to engage in politics, but only how to perform one’s assigned task within the social division of labor. Miao Feng’s richly detailed dissertation shows how mass education became a lively discursive site through which Communist, liberal, and fascist political currents in China articulated both theory and strategy after 1927. The realm of education was the point at which everyday life met the global crisis of depression and militarism in the 1930s. It thereby became a crucial space in which intellectuals could elaborate the concept of the masses as “a contentious unity” (ix) in the process of becoming. New York University. 2013. 320pp. Primary advisor: Rebecca E. Karl. 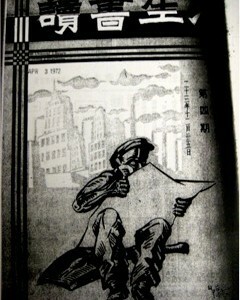 Image: The cover page of Liu Shi ed., Dushu shenghuo (Reading and Everyday Life),Vol.1 , no.4 (1934). This woodblock print image shows a manual labor sat on his tool reading newspapers and the industrial city was the backdrop.